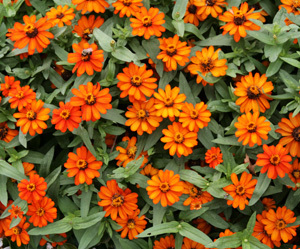 The National Garden Bureau has declared 2011 the “Year of the Zinnia”. These annual flowers (along with tomatoes) were chosen because they are popular, easy-to-grow, widely adaptable, genetically diverse and versatile. 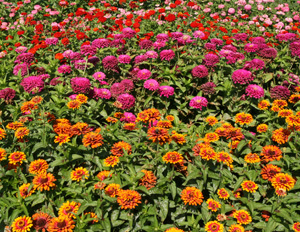 Zinnias are one of the most popular bedding plants world-wide. The 13 species in the genus Zinnia are all native to Mexico and adjacent areas, and many have been used to develop a diversity of different types of ornamental plants. 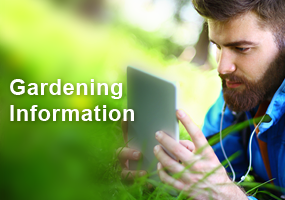 Ranging from 8″ mounds to rangy 3-4 foot tall bushes, and with flowers in a rainbow of colors, there is something for everyone among the hundreds of cultivars and hybrids that are now available. 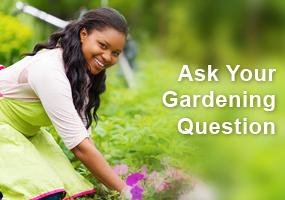 Flowers may be single, double or semi-double to produce blooms that look like dahlias, cactus flowers, or beehives. 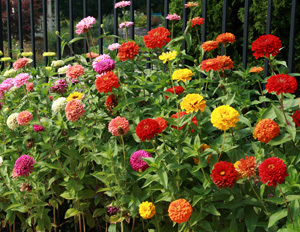 Zinnias are generally quick and easy to grow. With large seeds that germinate quickly into rather sturdy plants that require little care, zinnias are often suggested as a good crop for children and beginners. They are fairly quick to flower and provide long-lasting color throughout the summer. 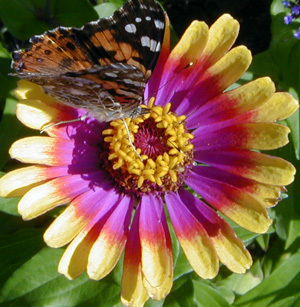 Zinnias thrive in hot conditions, are attractive to butterflies, and most make excellent cut flowers. Zinnias do best in full sun, in well-drained soil. 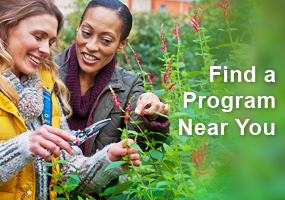 They can be seeded directly where you want them to grow once the soil warms, or young transplants can be set out to get a jump on the season. You can include them in borders, annual beds, mixed beds or cutting gardens. Many cultivars work wonderfully in containers, while the taller types make a good backdrop for shorter bedding plants. Many zinnias are affected by powdery mildew, especially when humid conditions prevail. Spacing to allow plenty of air circulation will help reduce this problem, and these days there are some resistant varieties to choose from. Zinnia elegans is a tall, upright type with wide, coarse leaves and large flowers. 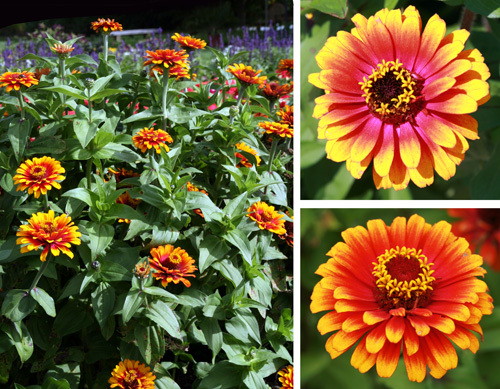 Z. angustifolia (narrow-leaf zinnia) is a low-growing species with flower color limited to orange, yellow and white. These two species have been crossed to create the popular ‘Profusion’ and ‘Zahara’ series, as well as other hybrids that exhibit some of the best traits of both parents (given the species name Z. marylandica because they were developed at the University of Maryland). ‘Profusion’ has been one of my favorites for several years. The ‘Profusion’ Series offers compact plants in a variety of bright colors. My favorite is the cherry or rose color (a 1999 AAS winner), but they also come in orange (also a 1999 AAS winner), white (2001 AAS winner, as well as winner of the AAS Gold Medal Flower Award), and other colors including apricot and the two-tone ‘Fire’. The plants are rather low-growing, only getting 12 inches high, but branch readily with dense, narrow leaves, spreading about 15 inches wide. They are covered with small, single flowers all season long. What makes these plants extra special is that they are highly tolerant of mildew and other foliage diseases. They’re great along the edge of plantings with taller annuals or perennials behind them, and work well in containers. Now the ‘Zahara’ series is poised to take over ‘Profusion’s spot in my garden. These plants are also award-winning, disease resistant cultivars but have larger flowers and come in a wider range of colors, as well as offering double flowers in some colors. ‘Double Zahara Fire,’ ‘Double Zahara Cherry,’ and ‘Zahara Starlight Rose’ were 2010 AAS winners, but there are also coral rose, scarlet, yellow and white in the series. I was least impressed with ‘Starlight Rose’ which didn’t consistently have the rose markings, and the white petals seemed to show disease or decay spots much more readily than the other cultivars. Zahara Zinnia Series: ‘Zahara Scarlet’ (L); ‘Zahara Double Fire’ (C); and ‘Zahara Starlight Rose’ (R). Another cultivar that became an instant favorite after I grew it for the first time this past year is Z. elegans ‘Zowie! Flame Yellow’. This 2006 AAS winner is a semi-tall (2-3 feet) cultivar with a unique bicolor flower pattern. The promotional literature states that it has a scarlet-rose center and yellow petals edges, but I found it was hard to describe the almost glowing magenta-pink color of the central color on young flowers. As the 2-5″ layered, semi-double blooms age they become more of a rich red and yellow, but still very attractive. The plants were very florific (even though I didn’t do much deadheading) and produced plenty of blooms right up to frost. I had planted them in drifts in the mixed garden next to the driveway, interspersed among tall ornamental kale (both blue-green ‘Nero Di Toscana’ and purple ‘Redbor’), and clumps of ‘Purple Majesty’ ornamental millet that filled in the spaces between a couple of shrub roses and perennials including fountain grass, iris and other plants. The spaces between all of the plants were filled with airy sprays of purple Verbena bonariensis, which was a great combination with the yellow and red zinnia flowers. And finally, another bicolor zinnia that I really liked when I grew it several years ago was ‘Sombrero’. This older variety of Z. haageana may not be readily available these days, but I was really impressed with its bicolor flowers when I grew it several years ago. The single blooms were supposed to have deep red centers and defined yellow petal tips, but in my yard they were more rose-colored in shading to red, a combination I really liked. This is a shorter cultivar, growing only 15-18″ tall and didn’t seem to be as florific as the ‘Zowie! Yellow Flame’ plants, but were still a butterfly magnet. 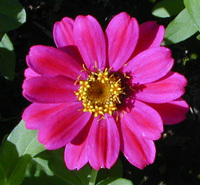 2011 was declared the “Year of the Zinnia”. It was chosen because they are popular easy to grow plants. With large seeds that germinate quickly into sturdy plants that require little care, zinnias are suggested for children or beginner gardeners. They produce lasting color all summer long. Spacing them to allow good air circulation will help reduce powdery mildew.